The Commodore 64 holds a special place in the hearts and minds of many geeks, myself included. It was the first PC I ever played with, and it might soon be the newest computer on the market if a crowdfunding campaign is successful. It's been a long time since the original C64 was in production. This re-imagined version of the original comes from Retro Games, a company in the UK that wants to bring it back in two forms, as a desktop and a handheld. The desktop version will still come packed in a beige keyboard, but one that's less bulky than before. It will also have some updated amenities, such as HDMI output, USB ports, mini-USB power socket, an audio jack, SD card slot, and a cartridge slot. You can expect updated guts as well, though Retro Games didn't provide any specifics there. The handheld version looks like what we'd picture as the lovechild of an original Game Boy and NES controller if the two had relations. It's outfitted with a D-pad, two fire buttons, function buttons, power and menu buttons, volume controls, micro USB power socket, micro-HDMI output, and an audio jack. Both systems will come pre-loaded with games, and Retro Games says it will be "REALLY easy to add more titles" to the mix from the "thousands of games you can legally download off the Internet." The financial goal on Indiegogo to make this happen is set at $150,000. Backers interested in the desktop version will need to pledge at least $150 (€133), or $175 (€155) to have it come bundled with a joystick. The handheld is going for $170 (€151) to backers. As for the name of the company – The64 team are working with – this will be revealed in the next few coming weeks. There is also news on the User Interface (UI). As the product range has changed the team at The64 have had new ideas in relation to the UI and we’re told they’ve done some “cool things” with it, not only this but also it looks “beautiful”. On the games side of things – it appears -this keeps getting better. Relating to the games we were told – as the backers – we will get a chance to vote on which games will be added come the final release, as mentioned back at the beginning of April. Finally the team goes on to list their forthcoming plan of action. - Once the partner paperwork is through, we will have direct access to marketing, factory and distribution channels, and will be laying out a comprehensive, graphical and trackable timeline so you can call follow progress. - This timeline signifies the start of the production process, so the clock will be ticking. - We will commission packaging proofs and let you have a sneak peek. - The games list will be announced. - The free extras we’re adding as a thank-you for backing us and being patient will be revealed, and we might even throw in a few more! it’s hard not to feel generous when you’re as excited as we are! - Once we have the UI working coherently, we’ll release a for-your-eyes-only walkthrough of the key features. Rock n' Wrestle on the go... One, Koo, Kee! It's very weird seeing the Commodore 64 being sold in places like JB Hifi & EB. There's been a lot of firmware updates for this of late (probably due to the US release), which has fixed a lot of the problems and added improvements. - v1.1.0 – Includes various firmware optimisations and enhancements. 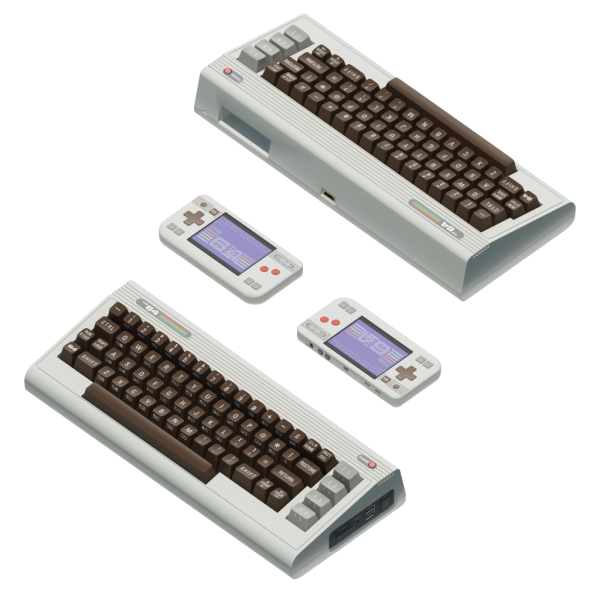 There's talk of a larger one being released too with a functioning keyboard according to what Dave the 8bit guy is saying. How much is the full size one supposed to cost? Don't know yet. Probably more expensive than the Mini.